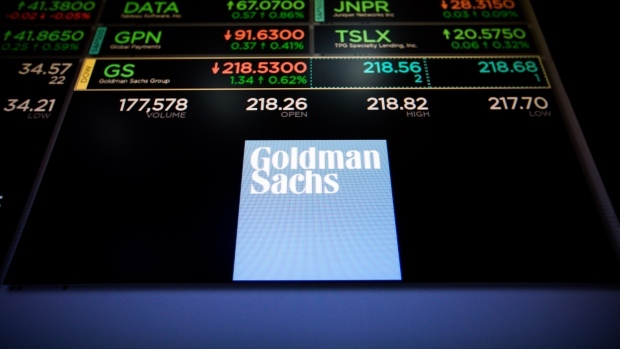 Goldman Sachs Group Inc. said John Waldron will be its next president and chief operating officer, the second most powerful position in the bank, when David Solomon becomes chief executive officer. Waldron, who runs investment banking, will take the new post on Oct. 1, the New York-based company said Thursday in a statement. Stephen Scherr, head of the consumer bank, will become chief financial officer in November. Martin Chavez, the current CFO, will co-head the trading division. Within the bank, Waldron was widely seen as the front-runner to become president, a post often shared between two executives. He and Solomon -- both veteran investment bankers -- are known to be close, and their rise to the control of the firm cements a dramatic shift in power away from the once-dominant trading division. Blankfein rose up through the bank’s operations buying and selling fixed-income products. While Solomon is known as a demanding boss, Waldron has crafted a softer image at work, with a less taxing approach as the head of Goldman’s most profitable unit. Those who know him define him as a stereotypical investment banker -- good golfer, consummate salesman and an effective advocate. In the broader world of M&A, Waldron is known for the ties he’s forged with corporate leaders such as Rupert Murdoch. Recently, that’s meant advising the patriarch of the Fox empire on selling a key chunk of his business to Walt Disney Co. in a US$71 billion transaction. Scherr has led the company’s consumer and commercial banking division since last year. He previously served as chief strategy officer, leading a team that helps decide where the bank should pursue new lines of business or acquisitions of its own.